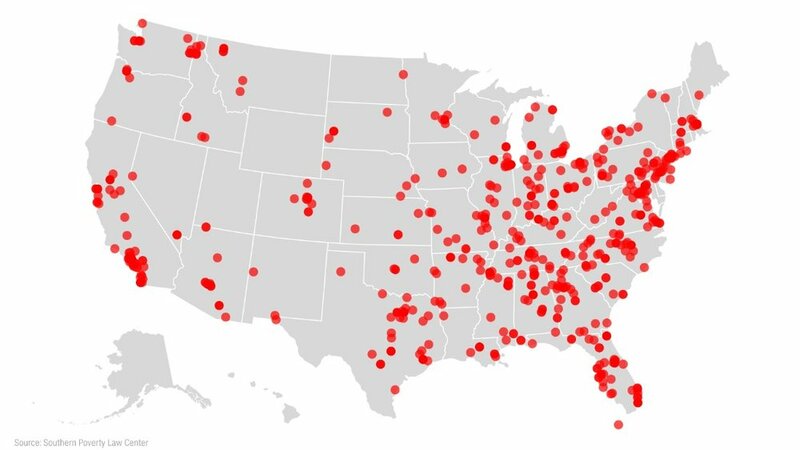 That's the number of hate groups operating in the US, according to data from the Southern Poverty Law Center. The Alabama-based nonprofit activist group tracks civil rights and hate crimes and defines a hate group as an organization with "beliefs or practices that attack or malign an entire class of people, typically for their immutable characteristics." "Over the course of a year, we have a team of investigators that scours the internet for racist publications and real world activities to find out which groups exist, which groups are still active and which groups come along," said Ryan Lenz, a senior investigative reporter for the SPLC's Hatewatch project. Some are classified as anti-LGBT groups, and some are black separatists, who don't believe in interracial marriage and want a nation only for black people, according to the group. Total number of Black Separatist groups in 2015. Black separatists typically oppose integration and racial intermarriage, and they want separate institutions -- or even a separate nation -- for blacks. Most forms of black separatism are strongly anti-white and anti-Semitic, and a number of religious versions assert that blacks are the Biblical "chosen people" of God. Black separatists typically oppose integration and racial intermarriage, and they want separate institutions — or even a separate nation — for black people in America. Most contemporary forms of black separatism are strongly anti-white and anti-Semitic, and a number of religious versions assert that blacks — not Jews — are the Biblical "chosen people" of God. If a white group espoused similar beliefs with the colors reversed, few would have trouble describing it as racist and anti-Semitic. Although the racism of a group like the Nation may be relatively easy to understand, if we seek to expose white hate groups, we cannot be in the business of explaining away the black ones. Increase in total number of anti-Muslim hate groups up from 2015. Anti-Muslim hate groups are a relatively new phenomenon in the United States, with many appearing in the aftermath of the World Trade Center terrorist attacks on Sept. 11, 2001. Beginning in 2010, anti-Muslim legislation increased and opposition to the development of an Islamic Center in lower Manhattan made headlines. Few of the anti-Muslim groups in operation before 2001 still exist, but those that do are key players in the movement today.